At Hisway, we believe that quality cannot be compromised. We are proud of the history and reputation the company has built for delivering a broad range of civil engineering and infrastructure projects in and around the Shoalhaven over several decades. Hisway’s continued success is a testament to the focus that is placed on the quality of its workmanship and the reputation that goes with that. Hisway is owned and operated by three directors, who are well supported by a core team of experienced staff. Key management and site supervision roles are performed primarily by the directors. We have robust systems and processes that are embedded within the culture of our business and are regularly reviewed for improvement. We recognise this as being fundamental to meeting our client’s expectations, upholding our company values, and operating our business with rigorous corporate governance. Our employees receive a comprehensive induction and ongoing training in our systems and processes to ensure a consistent quality process is implemented throughout all aspects of our projects and our business. The Hisway Management System Manual describes the policies, objectives, responsibilities, structure and application of management standards that make up the system. Safety of its employees and for members of the communities in which Hisway works is of utmost importance to the company. Hisway has always strived to achieve an excellent safety record, which is administered this through our health and safety management system. Our staff and subcontractors receive extensive induction training, and regular ongoing training to ensure that they are very familiar with our systems, processes and procedures. We believe that all work related injuries are avoidable and we constantly strive to improve our performance and our safety systems. Hisway is proud to have pioneered the use of this system in Australia. 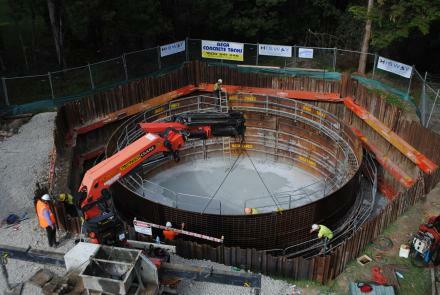 It’s recent application in the construction of wastewater overflow storage tanks for Shoalhaven City Council is testament to Hisway’s commitment to innovation and efficiency. Hisway is one of the few contractors outside the Sydney Metropolitan Area with extensive experience in the installation and commissioning of Atlantis Rainwater Harvesting Tanks, demonstrating our commitment to environmentally sensitive infrastructure solutions. Extensive use of this system at premium over 55s estate, The Arbour, Berry, has resulted in Hisway construction in excess of 3 million litres of on-site detention and rainwater reuse tanks.